It goes without saying that people watch movies to be entertained… escapism and all of that business. 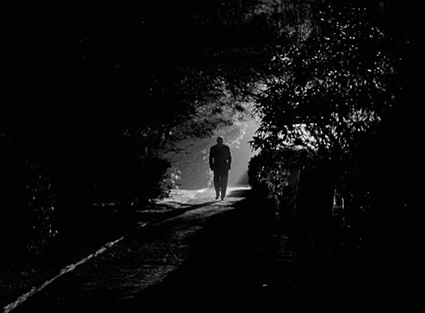 When it comes to horror films, people have many individual reasons to like them. A lot of people like to be scared when they watch a movie, others just find them to be easy to digest in terms of cinema. As an adult, I don’t find a lot of horror movies scary anymore. When I was a kid, though, I was disturbed more times than I wanted to admit. These days I still can get freaked out by some pretty unassuming movies, but that is probably because of my over-active imagination. There is always something I want to recapture as an adult when I watch these films, but it’s hard to put my finger on exactly what it is. Well, loyal readers, we can thank our trip through the history of the Zombie genre on a little self discovery. Today while we’re visiting the 1970’s, I’d like to stop by and say hello to Zombie. I remember so vividly the first time I ever saw this film. I had been invited over to a friend’s house, who had in turn invited others over (one of those situations where every seat on the couch is full with a few people sitting on the floor). One of my chums owned a video store and always had something with her. 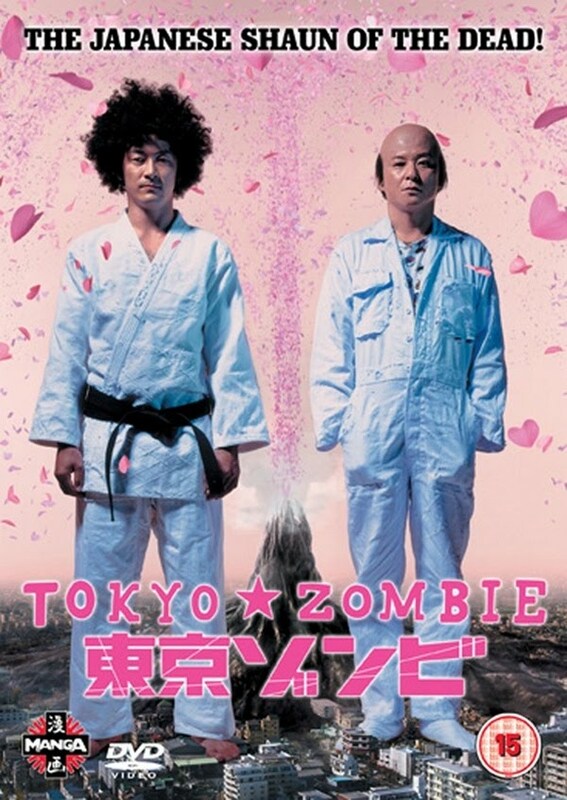 To this day, I have no idea if it was planned to watch that movie the entire time or not, but they suggested we watch this movie called “Zombie”. I was down; I’m always down. 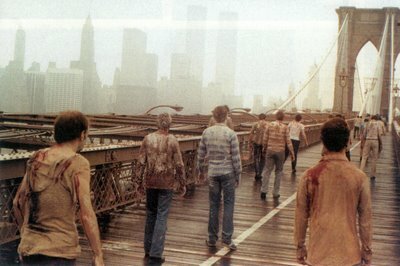 I had no idea that that this movie would end up being my favourite zombie movie by a wide margin and is still one of my favourite films of all time. 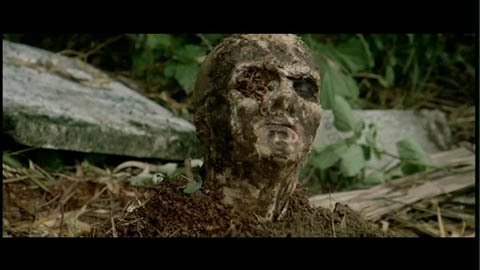 The film was directed by Lucio Fulci who had a somewhat lackluster career up until this point, but that all changed when Zombi 2 hit the market and blew up. 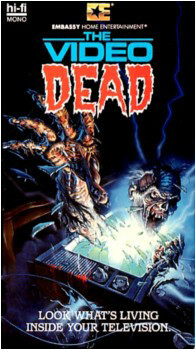 The film was well-received by audiences and made a ton of money, so it eventually was released in 1980 over in the west (with the new title of just Zombie). Well what’s it about? Basically some harbour Patrol in New York City finds a drifting yacht with big fat zombie in it. After the zombie is killed, an investigation follows and it turns out the boat belongs to the father of a woman called Anne Bowel (Tisa Farrow). He left behind a note that says he was at the island of Matool that is cursed with a strange disease. Following this lead, the Bowels and a news reporter head to the island to investigate. They meet more characters along the way to fill out the cast and presto! You have zombies on a tropical island. Now, everyone who knows this film knows that there are certain scenes that are nothing short of iconic. This is where everything ties together with watching Zombie with my with friends all those years ago. First, there is a zombie fighting a shark. No I’m not kidding, and it’s a real tiger shark. 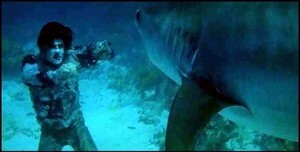 A man named Ramon Bravo was a shark trainer and Lucio had him dress up like a zombie and battle the creature under the water while they filmed. The zombie bites the shark the shark rips off the zombies arm. It’s truly an epic battle of legendary proportion. I will say this the first time my mind was officially blown. I had –never- seen anything close to that in a zombie movie. 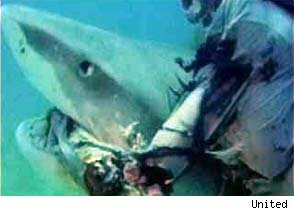 I remember one of my friends yelling “zombie shark” and the prospect of a shark being undead blew my mind further! Another iconic scene is pretty nasty. A character named Paola (Olga Karlatos) experiences a slow and gruesome death where her eye is slowly run through with a broken sliver of wood. Honestly, her eyeball gets closer and closer and when the wood finally punctures it, I remember every one of my friends cringed and yelled “Oh man!”Such a great reaction. The last thing I’ll mention, just as an aside, is the music. There is something about the theme of this movie that I just love. The creepy synthesizer that builds and builds while the zombies start to march, whenever there was more zombies the music matches the intensity and when the music is at it’s height you’re fucked; they’re everywhere. I remember walking home from watching this and trying to desperately remember the theme because I thought it was so cool. Maybe if I first saw this film by myself I wouldn’t have remembered it as much…or maybe wouldn’t have even liked it as much. In short, loyal readers, horror movies are best shared. Writers and directors of horror films (the good ones) try to recreate these moments that everyone can collectively say “Oh my god, I’ve never seen that before.” Those of us who get it, will get it, those of us who don’t, are excited for Transformers 3. 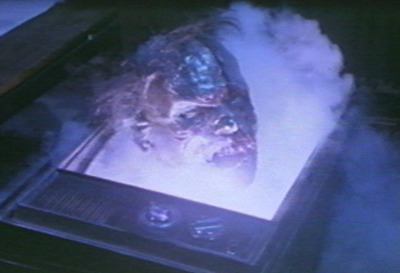 There’s one more stop on our look back at the history of the Zombie sub-genre. Stay tuned! Well we’re chugging along in our look back at the Zombie sub-genre, and we’ve come to the golden age of cheese: The 1950’s. What can I say about this decade? It was a time of prosperity after the hard years of depression and WWII. The baby boom was in full swing and audiences were looking to let the good times role. It was all about the American dream and fast, cheap entertainment. The 1950’s also experienced a big boom in the Sci-fi genre, seeing as we had just entered the atomic age. Films heavy in dialogue and atmosphere were out, lasers and aliens were in. The Universal style horror movie, however, was still alive and kicking with huge hits like The Creature From the Black Lagoon. For the most part though, people were watching genre films that had titles like “Attack of” or “Invasion of” and maybe the word “Giant” tossed in there. A standard formula for lot of these movies is as follows: Generic scientist or generic alien creatures do something that makes humans sad. I would note that the zombie genre was around in this decade, but it wasn’t anything like the other monsters of horror (although a few of them were forced to meet Abbot and Costello). While inspecting some of my options for the 1950’s, I noticed a problem: I really hate all of them. Although there wasn’t exactly a lot to choose from, for the most part they are all pretty terrible. Barely qualifying as Zombie flicks themselves, most fall into the realm of Sci-fi that just so happens to have Zombie-like creatures in it. Plan 9 from Outer Space (1958) is easily the biggest example of this, but I’m not really interested in discussing an Ed Wood movie. I will at least mention that his film Night of the Ghouls came out in 1959. Check them out if you dare, they are definitely in the so-bad-it’s-good category. 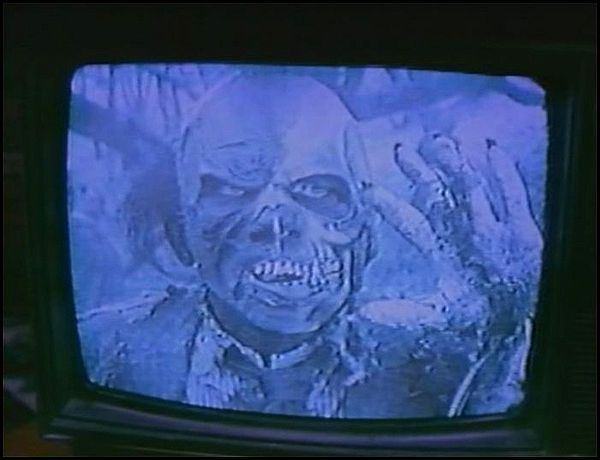 Well, Night of the Ghouls is just bad. Anyway, I am running low on further movie options, so I won’t drag this out any more. Today we tackle Zombies of Mora Tau. responsible for: It the Terror From Beyond Space, Invisible Invaders and the absolutely coma-inducing Voodoo Woman. Essentially, he was a director who was charged with making movies as cheaply and as quickly as possible. 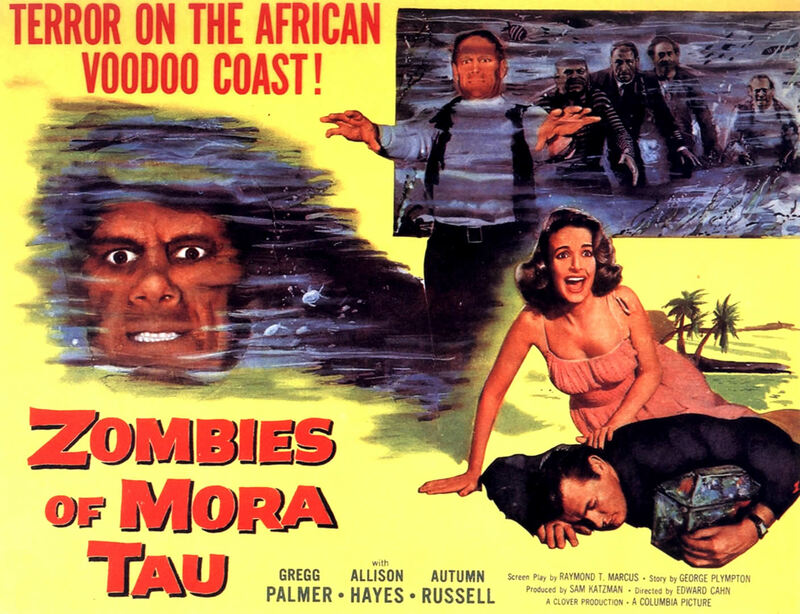 So here’s the deal with Zombies of Mora Tau: Mora Tau is a far off coast in Africa that is infested with zombies (sort of). I like how they are always hard selling the “Dark Continent” with voodoo and mysticism. This time instead of a spell brought on by some evil mastermind, the dead are basically cursed. It’s a lot like Pirates of the Caribbean, really. A group of sailors mutiny and kill their captain and his loyal men in order to steal a diamond treasure for themselves. Their murder triggers a curse where the Captain and his men rise from the dead and kill the traitors then sink the ship and the treasure. Now every time someone comes to find it; the Zombies rise to stop them. Of course, a crew looking for the diamonds hears this story from a gnarled old woman and don’t listen. Needless to say it’s a mistake they have to deal with through the entire film. It’s easy to see that the classic image of an undead pirate walking along the seafloor could possibly have come from this movie. 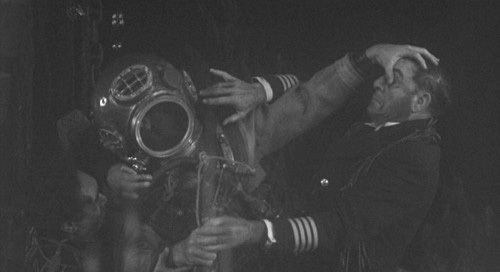 Not to mention the funny little fight scene with the guy in the divers suit. 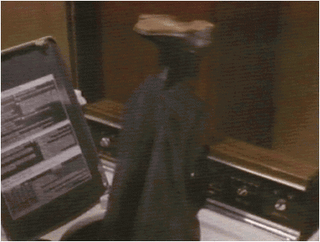 I don’t know why but it was pretty amusing watching the slow mo, and camera tricks they used to get the effect. An interesting thing I found about this movie is that the zombies’ one weakness seems to be fire. It’s pretty much a way to get them away from you, while bullets seem to have no effect (a lot like in King of the Zombies). All in all, this is a pretty standard film and I can see where it might serve to inspire other filmmakers as time progresses. I will say for any who are interested that this film is hard to come by (I had to use my internet powers to find it). I don’t really recommend it, but I felt compelled to include at least one movie from the 1950’s. Next up we hit the 1960’s where a little independent film changed everything.